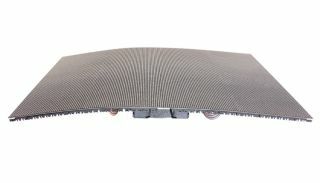 The What: PixelFLEX has introduced the 1.9mm TrueFLEX LED flexible video panel. Available in a 400mm-wide by 300mm-high panel, the new 1.9mm TrueFLEX is a new LED video solution for fixed installations that require an ultra-fine pixel pitch and a high-resolution LED video pallet in a flexible format. The What Else: Available in 1.9-, 2.5-, 3-, 4-, 6-, and 10mm indoor pitch options, the TrueFLEX LED video system quickly and securely attaches via magnets and its fanless design allows for a no-noise LED display in any space. Using magnetic LED modules and set screw ports, TrueFLEX can attach to virtually any surface, and the external sending and receiving control, paired with quality connectors, help ensure safe and reliable module connections. “As one of our most innovative LED video solutions, we are very excited to be introducing the addition of the 1.9mm resolution to the TrueFLEX family of creative LED panels,” said David Venus, PixelFLEX director of marketing. “In many environments, commercial, architectural, and creative, resolution is a key component to the success of the LED video deployment. With its new 1.9mm pixel-pitch option, TrueFLEX is now one of the highest-resolution, flexible LED products on the market and we are eager to see how video designers deploy the technology to achieve their creative LED video displays.